Foraminiferal Morphotypes: Birds of a Feather? G. ruber morphotypes (1) a and b: sensu lato; (2) c and d: sensu stricto. There are numerous intermediate transitional forms between these. 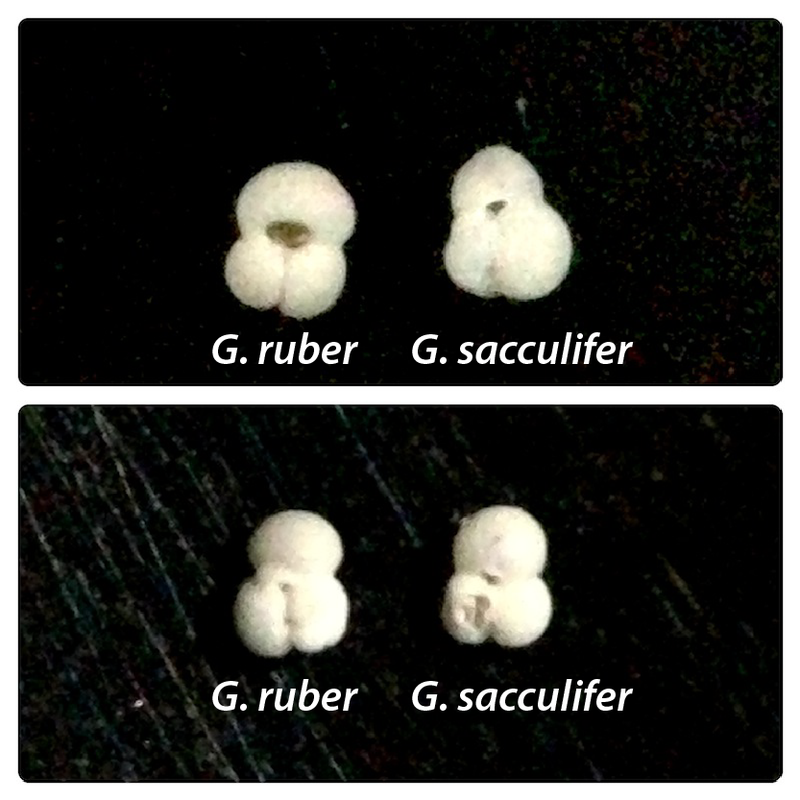 Globingerinoides ruber (G. ruber) is a rather famous planktic foraminfer (or foram for short), whose shell chemistry has been widely (and successfully) used to reconstruct ancient surface ocean parameters such as temperature and salinity. This foram lives in the upper ocean and creates a shell for its protection; the shell later sinks to the seafloor after its death. In 2000, a core-top (or near-modern) study by Chinese paleoceanographer, Luejiang Wang (who tragically passed away drilling corals in the South China Sea), analyzed stable isotopes in the two principal morphotypes of G. ruber's white variety: sensu alto - sl & sensu stricto - ss (as he christened them). The study seemed to indicate differences in the stable isotopic signatures of these morphotypes: ss seemed to have a warmer signature while sl was cooler. More recent studies seemed to find equivocal/ambiguous results for similar analyses i.e. some found significant differences but others didn't. However, nobody sought out to perform a comprehensive, controlled experiment specifically for G. ruber morphotypes. A lot of our knowledge about past climate change in the oceans comes from studies analyzing G. ruber shells. If these studies did not selectively discriminate between the two morphotypes prior to analyses, the Wang, 2000 study and others suggest that these reconstructions could be biased as we would be averaging signals from two different depths. Thus, our quantitative understanding of climate change itself may be biased! Furthermore, all our calibrations and verification exercises on G. ruber have been done on non-selective mixtures of these morphotypes. It is logistically very difficult to observe these critters in the wild. Here is a nice video that details the challenging process of culturing forams. Genetic work shows that it is NON-TRIVIAL to select different genotypes based on the shell morphology alone. As a birder, here is an analogy with birds: two birds that look very, very similar may, in reality, be different species and have completely different habitats and/or eating habits etc. If we are looking to gain information from the physiological chemistry of these birds (say, their feathers) to infer something about the environment they live in - it would be prudent NOT to mix samples of both the birds, correct? But... it is impractical to perform pilot genetic studies on living forams in tandem with paleoceanographic reconstructions using foram shells. So, how much would it matter if we did not perform genetic analyses accompanying paleoclimate reconstructions in the curious case of these two G. ruber morphotypes? Do they really live at different depths? How much does it matter if they did? A Sediment Trap: A device that collects foram shells before they hit the seafloor. Core-tops: The topmost portion of the seafloor, where recently dead foram shells accumulate. Downcore material: Cores spanning the last 4,000 years containing ancient foram shells. We sat down and decided to chalk out a strategy to be consistent in how we selected the stereotypical ss and sl morphotype sample. If the geochemical variability between the sets of 'intermediate' morphotypes was consistently different from the ss-sl sets, then the shape of the shell dictates its stable isotope signature, and hence provides evidence for cold/warm biases. On the contrary, if the 'intermediate' sets showed comparable variability to the ss-sl sets, then we cannot reject the null hypothesis that morphotypical variability has no effect on the stable isotope signature. We found that the ss-sl isotopic signatures for 37 sets from was statistically indistinguishable. The 'intermediate' sets showed variability very similar to the offsets in the ss-sl pairs. The sediment trap results indicated that the ss, sl, and intermediate morphotypes are good indicators of sea-surface conditions (and not deeper). Using a forward model and our observations, we found that both ss and sl morphotypes live and calcify in the upper ~35 m of the water column in the Gulf of Mexico. In the Gulf of Mexico, the uncertainty due to morphotypes in Holocene-based reconstructions is little-to-none. G. ruber (at least in this part of the world) appears to calcify in the topmost portion of the surface ocean. Not all previous reconstructions, calibrations, verification experiments that didn't discriminate between G. ruber morphotypes are wrong.